Charlestown is a blue-collar neighborhood where criminal behavior is passed down father to son. It is also just so happens to be the capital for bank robberies in America. Doug MacRay and his crew have pulled off numerous jobs within the city limits, but when Doug becomes romantically linked with the bank manager of his last heist, his team's operation falls under the watchful eye of the FBI. Expectations can ruin a movie. At times we set our expectations so high, they are bound to be let down. Other times we set them way too low and find ourselves pleased or impressed by a film's ability. "The Town" represents a rare time where my expectations were drastically high, but the film met them in nearly every way. Now, I must specify that I have a bias. I have a huge infatuation with Ben Affleck both as a actor and more recently as a director. The man has done no wrong in my book. Where people think he is a douche, I find him to be hilarious. He simply drips of charm. As a critic, it is my job to go into a movie without bias but with or without one, it is clear that Ben Affleck has directed a no-nonsense approach to the crime drama genre. What's more is he did a fantastic job in doing so. Truthfully, I can see and understand people's hold-ups about Affleck's acting, but his directorial skills put him in a rare class of directors. The man is on his way. About "The Town" specifically. As you may have seen, the trailer seems to reveal a good portion of the story. 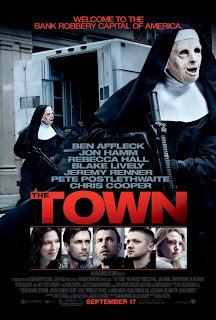 In actuality, 'The Town' isn't trying to hide anything. The film's focus is on telling the story, not surprising or shocking you. The trailer essentially sets up and reveals what we are shown in the opening of the film. Ben Affleck doesn't have some big reveal or surprise for you, the movie is purely a straight forward crime drama. A crime drama that is fabulously told through the perspective of a veteran criminal. Visually, I found "The Town" stunning. The film bleeds its blue collar backdrop and slams home the compounded aged city structure of Charlestown. Affleck and cinematographer Robert Elswit do a staggering job of capturing the cityscape, not to mention the varying locations. Elswit who is a powerful director of photography, once again does a beautiful job framing the characters throughout the 123 minute drama as well. Before you start to think this is going to be one huge stroke-fest about how much I love "The Town," don't be so quick to judge. I did have issues with the character development. The characters are pretty flat and really don't bring anything new to the table. We've seen each of these character types before. The development for each character comes across as a given. There are ultimately no surprises within this film or in its character development by any means. The characters are connectable, but they just don't have anything that sets them apart from what we've seen done previously. While the characters within "The Town" may be fairly plain, the performances are far from that. The entire cast delivers poignant and memorable portrayals. Credit should be awarded to Ben Affleck and the casting department for filling the cast with such astounding actors. Jeremy Renner, Rebecca Hall and Jon Hamm are all remarkable, as is Affleck. It really is an all star cast. Affleck in particular does a polished job of sharing the screen with his co-stars. His scenes opposite Renner and Hamm are chill inducing. I was really impressed by the attention that is paid to the performances. They are all quiet, but masterfully explode on screen. This is our first look into Affleck directing action and the man shows he knows what he is doing. Each of the heists are enthralling, filled with high energy and no nonsense. The action sequences are beautifully mapped out, playing with plenty of inspiration and thrills. Affleck furthermore put together a white knuckle car chase sequence that had me holding my breath throughout most of the pursuit. The cinematic eye of Robert Elswit weaving through intricate streets of Charlestown matched with the break neck speed of the chase is extraordinary and a highlight of the film. Overall "The Town" was exactly what I wanted. A no nonsense crime drama dusted with some intense action. Ben Affleck has already shown he is obsessed with Boston and the young director definitely shows his teeth with a striking job both behind and in front of the camera. The performances by the entire cast are unmarred truly making the minimalist characters penned by Peter Craig and Ben Affleck come to life. The story might not be for everyone moving at a slower rate and being extremely straight forward, but fans of crime dramas should walk away more than pleased by the quality and presence displayed by Affleck. Another Bill & Ted Adventure?